Paris teaches you that appearances can be deceiving. One of the biggest charms of the city is how it can change from tiny to titanic, small to staggering, in a matter of meters. Mini cobble stone streets open onto magnificent esplanades and hidden passages transport you to grand boulevards. I can’t think of a café that better represents this Parisian paradox than the newly opened 5 Pailles in the 10th arrondissement. 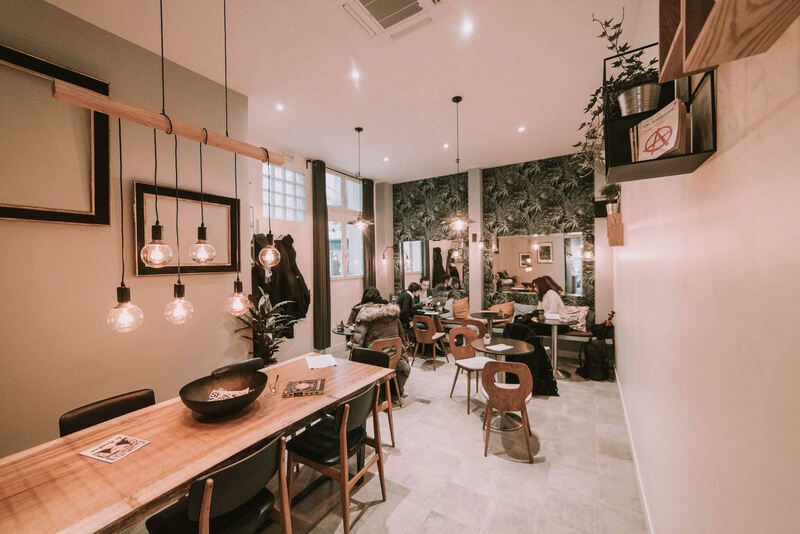 As you approach the café walking up rue du Faubourg Saint-Denis, a large window front reveals a bar big enough for a few stools and undoubtedly a few laptops paired with coffee cups. 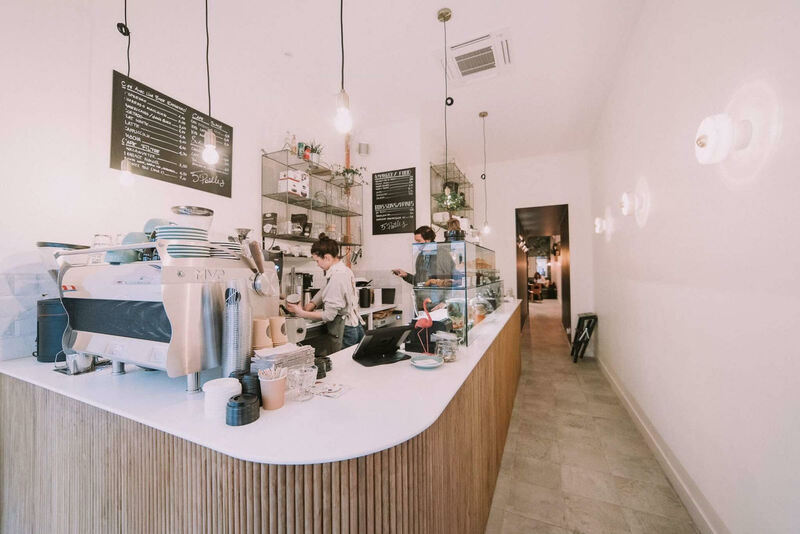 Upon entering the café, a barista station and deli counter presents itself, tucked into a corner of a few-meters-squared space. In a city where real estate and space are limited, you’d be tempted to think that the coffee shop stops there, but curious coffee lovers who wander down the small corridor just after the cash register will discover that 5 Pailles has a secret garden, a brightly lit, floral-focused dining room that feels like a hidden haven. The sense of secrecy in this buzzing space, packed with in-the-know coffee sippers, makes it feel intimate, like you’ve been welcomed into a friend’s living room. The hospitable nature of this café is also embodied by its affable staff, most notably by the always-smiling Ege, a Turkish native who came to coffee after burning out at his job in the pharmaceutical industry. Despite the international nature of the team, the menu at 5 Pailles is more reflective of thoughtful coffee-shop cuisine rather than Franco-Turkish flair. A veggie-forward menu has hints of Mediterranean influence, seen in the Feta and Olive Salad with quinoa and avocado (8 eur). Sandwiches include options for both vegetarians (The Cheese Lover: pickled beets, chevre, and persillade, 6.50 eur) and carnivores (The Meat Lover: jambon sec, roasted bell pepper, artichoke, and caramelized onions, 6.50 eur). 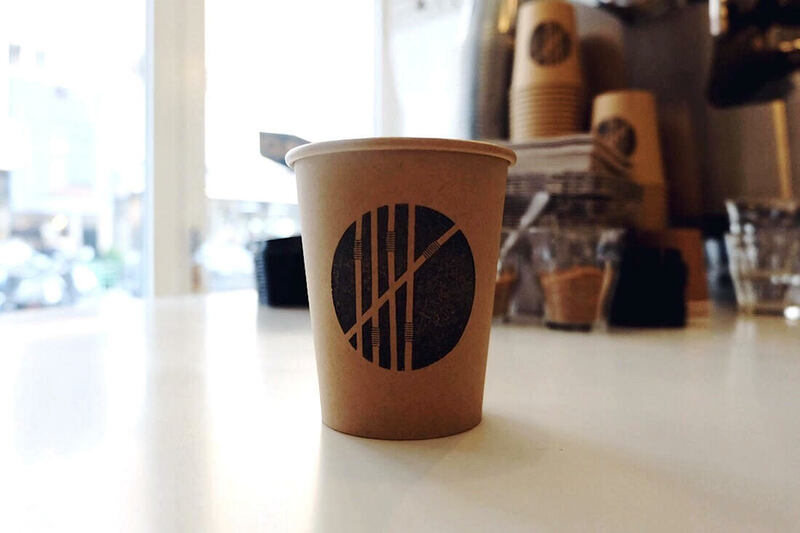 The house coffee is local favorite, Café Lomi (roasted in the 18th arrondissement), but farther-flung roasters are often brought on board, most recently La Cabra (Denmark) and Bonanza (Germany). Coffee drinks, including espressos (2.50 eur), lattes (4.50 eur), and filter (3-4.50 eur) all go perfectly with any of the café’s pastry options. A Scandinavian-inspired Coffee Bread with cardamom and cinnamon (2.50 eur) makes for a fine fika and a traditional scone (2.50 eur) is a great excuse for indulging in tea time (teas and tisanes: 4.50 eur). For me, the star of 5 Paille’s sweet treats is by far the Limoncello and Basil Cake (4 eur). The subtle mix of sweet, tart, and vegetal lets each element shine and immediately brings sunshine into your day, much like this darling, hidden away café. Who doesn’t love a hidden address? Check out one of our other favorites, Lavomatic. My Parisian Life shares their take on 5 Pailles. 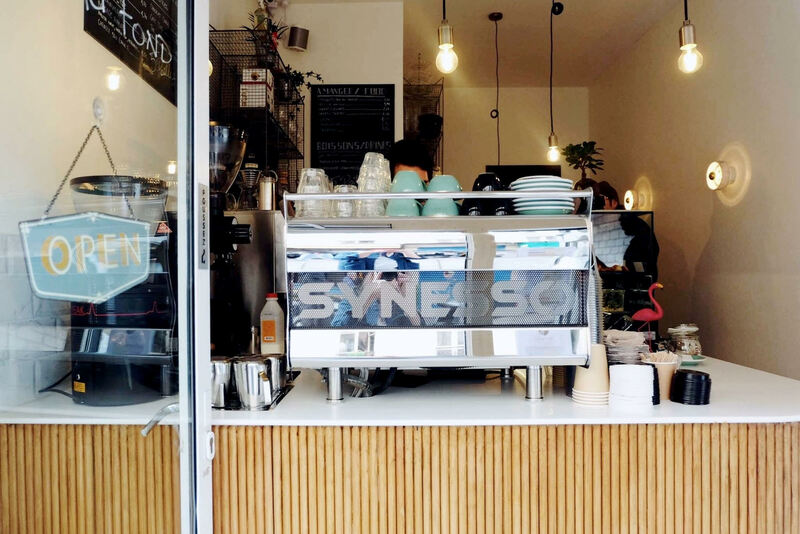 Head to the 18th arrondissement for another coffee favorite, and other recommended addresses from Susan of Fleurishing. Written by Emily Dilling for HiP Paris. All photos by Emily Dilling. Looking for a fabulous vacation rental in Paris, London, Provence, or Tuscany? Check out Haven In.